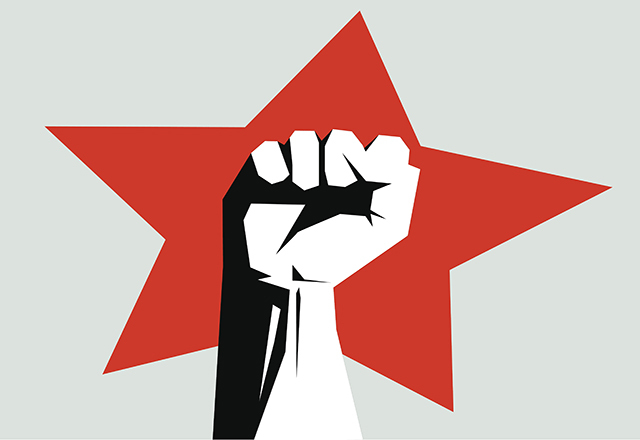 Stop the high-fiving and get to work . . . right now! 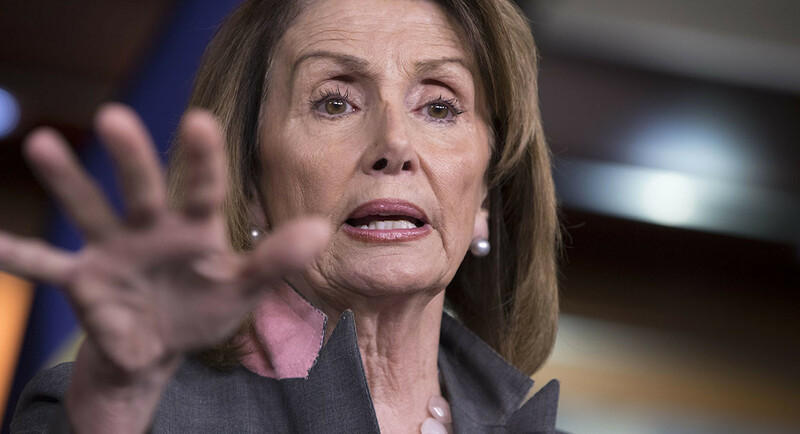 The nation’s two leading Democratic politicians — House Speaker Nancy Pelosi and Senate Minority Leader Charles Schumer — have been high-fiving each other and doing their touchdown dance ever since Donald Trump surrendered on his fight to build The Wall. 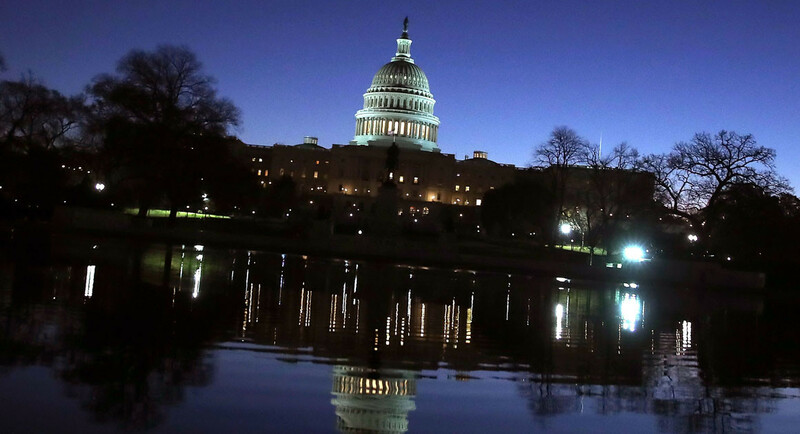 The partial government shutdown has been lifted. The 800,000 affected federal employees are going back to work and/or getting paid for their public service. Fine. I’m happy with the result. The three-week budget deal doesn’t include money for The Wall. It now gives lawmakers and the president time to negotiate a long-term budget agreement that includes comprehensive border security, which the president says he wants. However, I am struck by the declaration of victory that Pelosi and Schumer have proclaimed since the president’s capitulation. They haven’t won a damn thing! They got a reprieve on behalf of the federal employees who were furloughed or forced to work without getting paid. The border security fight still must be waged. Trump said he is willing to negotiate. I am going to presume that Pelosi and Schumer are willing, too, to search for a compromise. I shouldn’t have to do this, but I’ll remind them anyway: Three weeks is going to evaporate quickly. We’re going to find ourselves in this mess in the proverbial blink of the eye. 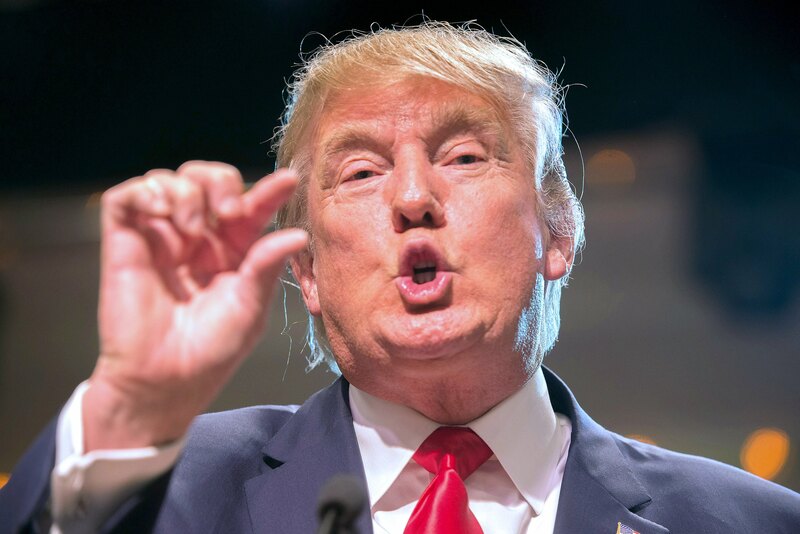 Trump says he might declare a “national emergency,” even though it is highly debatable whether one actually exists along our southern border. Such a declaration would empower the president to deploy military personnel to build The Wall; he also would be empowered — he says — to divert funds from Pentagon operations to pay for the work. I do not want Donald Trump to make any such declaration, as it will prompt immediate legal action against the president. It gets down to this final notion, which is that the very idea that the federal government cannot function fully and efficiently for longer than just weeks at a time is utterly beyond ridiculous. My advice to “Nancy” and “Chuck” and “The Donald”? My quick takeaway from Donald J. Trump’s brief speech tonight is this: The president didn’t mention the government shutdown that has been the result of this fight over whether to finance construction of The Wall. Meanwhile, the speaker of the House and the Senate Democratic leader were all too willing and able to mention the shutdown in their rebuttal to the president’s speech. I believe I heard a totally reasonable request from Senate Minority Leader Charles Schumer: Mr. President, sign the GOP-sponsored funding bill approved by Congress and then call off the shutdown and let us negotiate a valid approach to shoring up our border security. 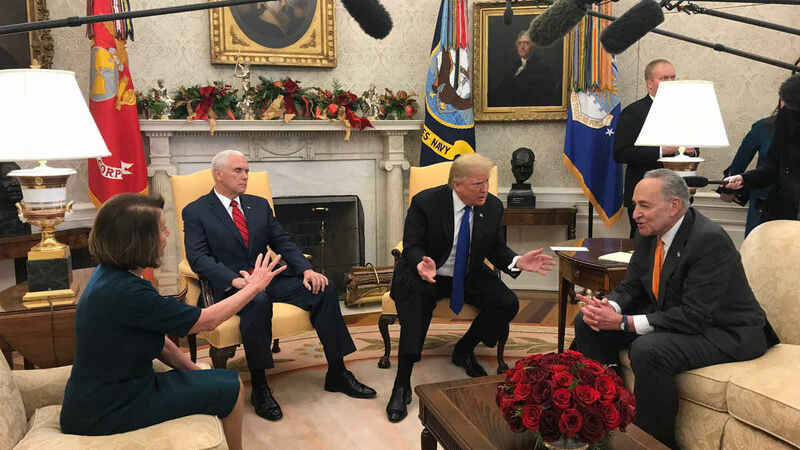 Schumer and Speaker Nancy Pelosi don’t want the wall. Neither do their fellow congressional Democrats; nor do an increasing number of Republicans. Indeed, the ranks of GOP lawmakers who want to end the shutdown also is growing. We didn’t hear a word from Trump about the shutdown. Instead, he told us yet again about the horror stories involving crimes committed by illegal immigrants. Trump is conflating those tragedies with the 12 million people who have entered this country illegally. The president is stoking fear. 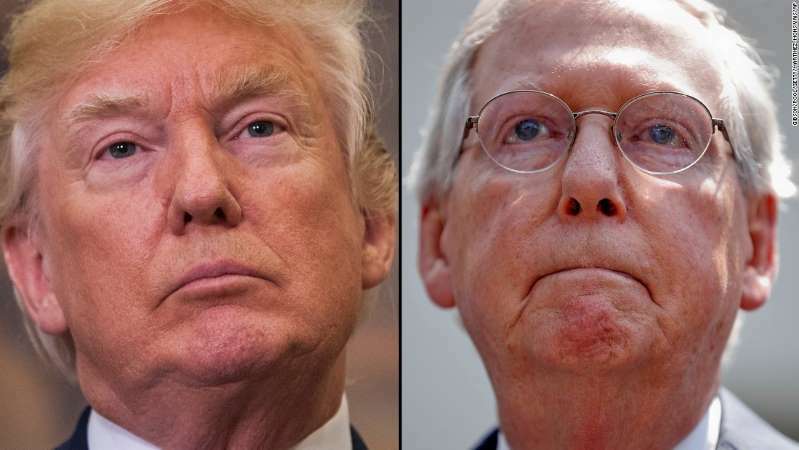 U.S. Sen. Mitch McConnell’s absence at Donald Trump’s Rose Garden press conference was so very conspicuous it has become a serious back story in the government shutdown drama that goes on and on and on. The Senate majority leader once all but guaranteed that there wouldn’t be a partial shutting down of the government. Indeed, he and the president reportedly agreed on a deal approved by the Senate unanimously to fund the government until early February. Except the measure didn’t have money for The Wall that Trump wants to build along our southern border. Trump got a gut full from right wing talkers, so he changed his mind. Yep. He stabbed the majority leader in the back. Which makes me wonder if McConnell and Trump are at each other’s throats yet again. He wasn’t standing with the president as Trump talked about the meeting he had with Speaker Nancy Pelosi and Senate Minority Leader Charles Schumer. He hasn’t spoken publicly for several days about the status of the shutdown, other than to say the Senate would not take up the House bill that Pelosi promised to send to the Senate. Aren’t he and Trump big-time pals these days? Don’t they stand together in favor of The Wall and opposed to any measure that doesn’t include money to build it? He should have been in the Rose Garden. Mitch McConnell is missing in action. Given that no one seems able to talk sense to the president, then maybe McConnell is planning a mutiny. France shooting = U.S. border security? I need help connecting these dots. A fellow who was born in Strasbourg, France, opens fire and kills a fellow French citizen. A French citizens commits mayhem against his countrymen. Is that right? OK, then the president of the United States seems to use that incident as an argument for his desire to build that “beautiful wall” along our southern border to keep the bad guys from pouring into the country. Then he rakes Sen. Chuck Schumer and Rep. Nancy Pelosi over the coals because Democrats don’t want to spend the amount of money the president wants to build that wall. I need help understanding how the president can connect the these incidents together. This individual, the president, is out of control. 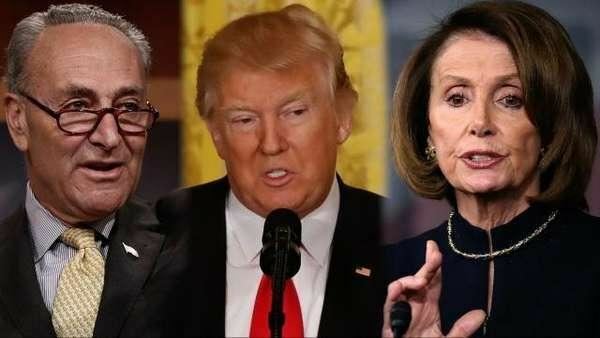 Donald Trump sought to negotiate a deal today with Congress two top Democrats: House Speaker-to-be Nancy Pelosi and Senate Minority Leader Chuck Schumer. What the president managed to do, though, is box himself into a corner. He did so all by himself. With just a little prompting from Schumer. To which I say: Wow, man! Schumer kept resisting any notion that the Senate would vote to give Trump approval for $5 billion to build a wall along our southern border. That prompted Trump to do an amazing thing. He took ownership of a potential government shutdown if he doesn’t get his way on wall financing. Yep. That’s right. The president of the United States has seized the issue all for himself. He would be glad to shut down the government if Congress refuses to spend the money he wants to build the wall. Oh, is Mexico going to pay for it? For any portion of the wall. Hah! Congress and the president have a few days to work out something to keep the government functioning in its entirety. The meeting at the White House didn’t go well. Trump stormed out, tossing papers. Pelosi and Schumer, meanwhile, have sent a signal that the president is going have to deal with an entirely different Congress — specifically the House — than the government branch that served as his lapdog for the first two years of Trump’s term. Do you get the feeling that we’re heading for some wild water? We had all better hold on with both hands. Members of Congress — senators and House members — are being harassed and hassled themselves by bogus complaints alleging sexual harassment. What has become of this scandal? Has it grown to something no one recognizes? Senate Minority Leader Chuck Schumer has had to fend off a fake complaint, as has Sen. Richard Blumenthal. Yes, this issue is real. It has reached scandalous proportions as scores of women have levied credible, legitimate complaints against powerful men in government. Three of them have been forced to resign; others are declaring their intention to bow out after the 2018 midterm election. Some of these accusations involve some truly hideous conduct. But there now appears to be some evidence of bogus allegations surfacing. Let’s be careful — shall we? — as we continue to grapple with this matter. We have complaints being lodged against none other than the president of the United States. Many of those complaints seem quite credible, in my humble view. The president has called them liars and said their accusations are part of a “fake news” effort to undermine him. Then we have comments from the U.S. ambassador to the United Nations, Nikki Haley, saying that all complaints “need to be heard.” I agree with her. Then again, let us be take care that we don’t push the sexual harassment panic button at every single complaint. Human beings are quite capable of tricking the rest of us.